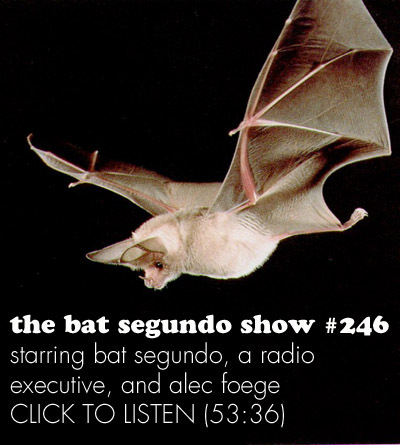 Alec Foege appeared on The Bat Segundo Show #246. 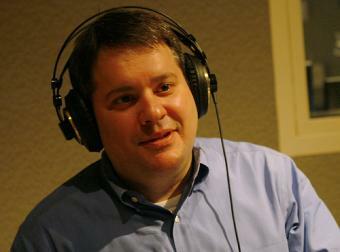 Foege is most recently the author of Right of the Dial. Condition of Mr. Segundo: Defying the maker of rules and dealing with fools. Subjects Discussed: WINZ switching to Air America because of Fahrenheit 9/11‘s success, Jesse Jackson and Keep Hope Alive, profitability vs. integrity, Clear Channel’s Republican viewpoint, conservative talk radio and profitability, Rush Limbaugh, Clear Channel executives as better money managers, the Mays family approaching radio from a profit standpoint, the apolitical realities of financial mismanagement, voice tracking as a cost-cutting measure, the public radio bailout, pre-scripted radio conversation and the lack of spontaneity, Clear Channel’s Walmart approach to radio, the decline in radio advertising courtesy of the economic downturn, Clear Channel selling off stations in 2008 to survive, the self-correcting market impulse, how radio caused a San Francisco Franz Ferdinand concert with only a few hundred people showed up, Girl Talk and the Internet as an alternative marketing device, the few slots on radio playlists, Gnarls Barkley and Internet-based rock stars, Nine Inch Nails, Radiohead, and the “pay what you what” mentality, satellite radio, the online advantages of local radio, payola, record labels paying radio stations, free market opportunities opened up by the Telecommunications Act of 1996, Howard Stern on David Letterman, Clear Channel buying Inside Radio and thus buying criticism, the FCC, and the future of radio. Correspondent: I wanted to ask you about the subject of payola, which comes up multiple times in this book. Eliot Spitzer is, of course, unfortunately now out of the game. But he did do some good things, such as investigating the relationship between the promoters and the radio conglomerates. One of the most condemning documents revealing Clear Channel’s “pay for play” policy was when an email from Sony’s Epic label basically asked, “What do I have to do to get Audioslave on WKSS this week? Whatever you can dream up, I can make it happen.” Now there was extraordinary payola in all these instances. Sometimes as much as $400,000. But if you are a promoter, you are always going to have to deal with payola on some level. Whether it’s a fruit basket. Whether it’s a free CD. I mean, what is the maximum level of what we might call payola? Inarguably, I bought you this coffee that you’re enjoying right now. So are you perhaps — is this payola? I don’t know. Foege: Well, it’s good that you just disclosed it. Foege: That’s a step in the right direction. And I guess I didn’t explicitly state that I wouldn’t talk with you if you didn’t buy me a cup of coffee. And I did offer to pay for the cup of coffee as well. You know, the funny thing about payola is that it’s existed since the beginning of radio. I mean, radio has traditionally been a pretty dirty business. It was before Clear Channel existed. It continues to be. A lot of people in the business that I spoke to said payola always exists in some form. Every once in a while, it emerges into the public sphere. And somebody like Eliot Spitzer comes along and tries to have some effect on it. But for whatever reason, people trend back to their bad habits again. And the corruption begins again. The interesting thing about payola is that I think, particularly in the modern era, it’s had a very insidious effect on radio. Because one could argue that it’s not good for radio stations and radio companies. Sure, there are payments involved. But as Clear Channel was wont to argue, when it was sort of caught up in all this, even with the large sums that you mentioned, if you look at the total revenue that Clear Channel now brings in, those are hardly numbers that would matter to them overall. But the insidiousness comes in the fact that, first of all, ostensibly radio stations are attracting listeners with songs and music that they want to hear. Of course, payola tips that scale and simply has people at record labels paying to get particular artists and songs on the air, whether people want to hear them or not. Or whether there’s any criteria other than the payment to get them on. So arguably, you could say that radio stations can lose listeners if they’re embroiled in payola. And it’s just crappy music that nobody likes. Which certainly has come up in the past. The other thing is, obviously, payola hurts artists. And in combination with all the other tactics that Clear Channel employed, as it got larger, to cut costs and to streamline their overall operation, payola was yet another part of the equation that essentially cut out most emerging artists. Because how could they compete against songs that were simply on the air because people were getting paid off. The only interesting thing about this is that payola is a very difficult crime to explain to the average person. Because, of course, some variations on what payola is exist in different kinds of venues. A classic example is when you walk into a supermarket, and you see a big pile of Rice Krispies up at the front of the row. Foege: Few people realize that Kellogg’s paid to have that stack put there. And that also happens to not be illegal. The reason that it’s illegal when it comes to radio is because radio, through the FCC, has a federal mandate. The airwaves are owned by the public. So this is a corruption of the public’s airwaves when these payments are made. And so that’s where the crime is involved. Because there’s an acknowledgment there that mass media, because of its power and influence, is different from boxes of Rice Krispies at the supermarket.